Each year, the center delivers care during more than 83,000 outpatient visits. 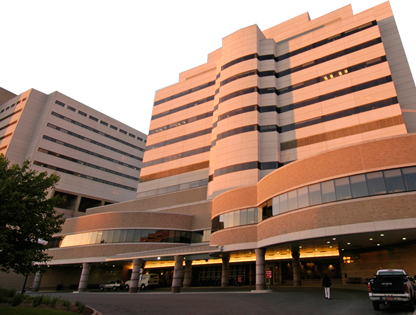 More than 3,800 adult cancer patients are admitted to the University Hospital each year--more than any other hospital in Michigan. The University of Michigan Comprehensive Cancer Center received the most grant funding from the National Cancer Institute among all medical schools in the country in 2010. The top five cancers diagnosed and treated at U-M are: melanoma, breast cancer, prostate cancer, blood cancers, and lung cancer. As a member of the National Comprehensive Cancer Network, an exclusive consortium of leading U.S. cancer institutes, the University of Michigan Comprehensive Cancer Center helps to set national guidelines to ensure delivery of consistent, high-quality care. A multidisciplinary approach is the gold standard in cancer care. This means that lung cancer patients-like patients with many other types of cancer-consult with a team of physicians and specialists when they come to the University of Michigan Comprehensive Cancer Center. The U-M Multidisciplinary Lung Cancer Clinic is designed to provide a comprehensive evaluation and treatment plan after visits with a thoracic surgeon, medical oncologist, radiation oncologist, pulmonary medicine expert and oncologic psychologist-all in the course of a single day. Treatment is informed by the latest research available. The Cancer Center supports research from its earliest stages in the laboratory to its ultimate application in the clinic. Please visit www.mcancer.org for more information.